The Sacco Bambino Newsletter | A "Santa Baby" Baby Shower! To Plan The Perfect Holiday Baby Shower! Each month we look forward to updating you with the latest and greatest information on all of our new Baby Shower Gift Products and Baby Shower Planning Ideas with The Sacco Bambino VIP Newsletter. We also keep you updated on all special offers and promotions at Unique Baby Shower Gifts. Some offered only to You, our Special VIP subscribers! If you like this informative newsletter, please do a friend, and us, a big favor by "paying it forward." Do you know someone who is planning a baby shower? Or, someone who's looking for awesome baby shower gift ideas? Yes, it seems to get closer and closer, preparing for the festive Holiday Season a little sooner each year. Be prepared for your Holiday & Christmas Baby Shower with some of our new tips and ideas. Have you ordered your Holiday Cards yet? If not, find some great deals on Holiday Cards for friends & family. And, use these same designs to transform regular Holiday Cards into Unique Baby Shower Invitations ... see how we did here it on our Christmas Baby Shower page. The "Count Down" is getting closer and the Holidays are just around the corner! Remember last year and how crowded it was at the mall? Well, we have a plan ... we'll tell you our secret so for next year you'll be up-to-date. Yes, it's such a great feeling ...WHEW! Check our reminder found at Baby Holidays Gift Ideas ... and keep up with your monthly gift purchases. As always, remember that "Planning early saves time, money and your sanity!" ;) So, make sure you bookmark our What's New page for awesome gift ideas and all of our latest baby shower planning ideas! A Santa Baby Celebration! Our newest Holiday Baby Shower Invitation is perfect for a Baby Boy or Baby Girl Shower. Impress your guests with this "Santa Baby" invitation! For our free invitation below, simply download and print ... it's easy! We know you will enjoy using these awesome invitations as much as we enjoyed making them. So convenient to print and great to hand out to family, friends and co-workers. And ... we've made it easy to download our invitation of the month! Go to our VIP Invites page and you'll find the Free Baby Shower invitation of the Month at the bottom of the page. Tip: Don't forget envelopes if you need them, they're on the same page ... Our Free Baby Shower Invitations fit perfectly into these great quality envelopes. Your guests will think you spent a fortune on your "custom" invitations and quality envelopes ... don't worry ... our lips are sealed ;) Enjoy! Don't want a template card? 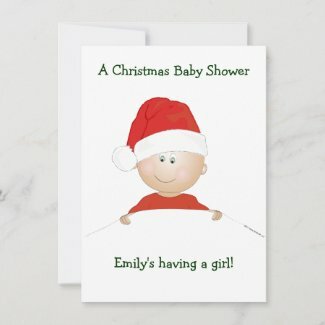 Then Customize your own from our "Santa Baby Collection" at our Sacco Bambino® Zazzle storefront. And remember, Don't Keep It To Yourself ... Give A Shout Out To Your Friends! Know someone who's looking for awesome baby shower gifts and baby shower planning ideas ... and they are as busy as you? Share our website right now with your friends and let them in on our free baby shower invitations, our promotional deals and ... of course, free baby shower planning ideas. Tell them how easy it is to subscribe to our Sacco Bambino® VIP Newsletter. We're also adding ... slowly, but surely ... more Invitations and Wall Art to our Sacco Bambino Store at Zazzle. These items are all customizable and you can change whatever design elements you wish. While you're there, check out out new cute monkey designs, just recently added. And, remember to get Mom-To-Be a "Santa Baby On The Way" shirt. Check out our entire "Santa Baby Collection" at our Sacco Bambino® Zazzle storefront. Each month we include these links to make baby shower planning a breeze ... so, bookmark these helpful links to our website so you'll always be ready! The Perfect Gift ... Before, During And After Baby's Birth! Unique Baby Gifts That Moms Love! Discounts On Sacco Bambino Products Just For Our VIP's! Find them here on your very own special pages ... Sacco Bambino Wall Art VIP Page and Sacco Bambino Travel Gift Sets VIP Page. Here you’ll find all of our special Sacco Bambino product promotions ... especially for YOU! Many times we feature new and creative products that we’ve found on our “What’s New” Page. See what new special deals on baby shower products and baby shower planning ideas that we’ve "Just Found"! Also check out "Who’s Due" ... on our “Celebrity Baby Shower” News and Updates! Subscribe to the Bambino Blog ... you know, sometimes at work, it’s hard to check your email ... but, you can subscribe to our Bambino Blog RSS feed for your home page and you’ll get continual updates as soon as something new is added to our site. Want to build your very own Baby Shower website ... or a website about any passionate interest you might have? We'll see you next month with our newest additions, our latest free baby shower invitations and much more ... so stay tuned!